Dennis Rader an American serial killer known as The BTK Killer and The BTK Strangler. Rader gave himself the name BTK standing for Bind, Torture, Kill. He murdered ten people in Sedgwick County (in and around Wichita), Kansas, between 1974 and 1991. During his spree he sent letters to the police and newspapers describing the details of his crimes. In one letter Rader demanded media attention for his crimes. In 2005, Rader was arrested near his home in Park City and accused of the BTK killings. He later confessed and was sentenced to ten consecutive life terms. Serial Killer Dennis Rader (aka) BTK Killer, BTK Strangler, Bind Torture Kill, was active for 31 years between 1974-2004, known to have ( 10 confirmed / 10 possible ) victims. This Serial Killer was active in the following countries: United States. Dennis Rader was born (Dennis Lynn Rader) on March 9th 1945 in Pittsburg, city in Crawford County, in southeastern Kansas, United States. He was born 1st of 4 children and raised by both parents. Rader was raised as a oldest child and had three brothers, Paul, William and Jeffery Rader. His father, William E. Rader, deceased 1966, Dennis (Age 21). His mother, Dorothea Cook Rader. Rader a heterosexual male citizen of the United States of America, with religious ties and/or beliefs connected with the Lutheranism religion, organization or belief system. Rader completed 14 years of school, received a college degree. Rader gained part of his education while attending Butler Community College, Wichita State University. Rader married, Paula Dietz, Dennis (Age 26/27) divorced Paula, Dennis (Age 59/60). He had two children, Brian Rader and Kerri Rawson. In 1974 (Age 28/29) Dennis Rader started his killing spree, during his crimes as a serial killer he was known to torture, strangle, stalk, and murder his victims. He was known to kill victims at his own home. He would keep personal items from the victim after the crime. Dennis Rader used a blindfold or simiar method of covering the victim's eyes. At least one victim was tied, bound, or otherwise restrained during the crime. At the time of his crimes he was living with his wife Paula in Park City, Kansas, US, where Rader was known to work as a serial killer, Agente de Seguridad Privada, butcher. He was arrested on February 25th 2005 (Age 59), convicted on August 18th 2005 (Age 60), sentenced to life imprisonment at El Dorado Correctional Facility in El Dorado, Kansas, US. Rader was convicted on charges of murder and other possible charges during his lifetime. Dennis Rader has been listed on Killer.Cloud since November of 2016 and was last updated 2 months ago. The following serial killers were active during the same time span as Dennis Rader (1974-2004). Dennis Lynn Rader (born March 9, 1945) is an American serial killer known as the BTK Killer or the BTK Strangler. He gave himself the name "BTK" (for "Bind, Torture, Kill"), which was his infamous signature. Between 1974 and 1991, Rader killed ten people in the Wichita, Kansas metro area. Dennis Rader on en.wikipedia.org, Retrieved on Sep 18, 2018. Juan Ignacio Blanco, Dennis Lynn RADER on murderpedia.org, Retrieved on Sep 18, 2018. Misty Sexton, Melissa Shaw, Dennis L. Rader on maamodt.asp.radford.edu, Retrieved on Sep 18, 2018. Kristin Elink-Schuurman-Laura, Rader, Dennis on skdb.fgcu.edu, Retrieved on Sep 18, 2018. Q365456 on www.wikidata.org, Retrieved on Oct 10, 2018. Dennis Rader on www.biography.com, Retrieved on Dec 14, 2018. Dennis Rader on www.alcatrazeast.com, Retrieved on Jan 10, 2019. Dennis Lynn Rader, the BTK killer on disturbinghorror.com, Retrieved on Feb 2, 2019. Dennis Rader on www.serienkillers.de, Retrieved on Feb 18, 2019. 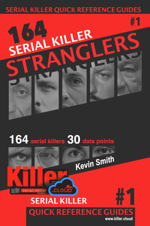 Serial Killers Statistics, charts Dennis Rader is included in: Serial Killers By Gender, Age of Serial Killer by Date, Killers By Astrological Sign, Serial Killers IQ Level, Highest Degree Achieved, Sexual Preference, Birth Category, Active Serial Killers by Year and Statistical Boolean Questions.